The drive to end outbreaks of diseases has gained worldwide attention over the years. Kudos to many Government and Non-Governmental Agencies who have joined hands to eradicate many life-threatening diseases. However, there seems to be some diseases that have received less attention or probably ignored during these periods and have turned out to be a thorn on our neck. The first time I heard about the name "Neglected Tropical Disease" was during my secondary school days. This name has since then got me wondered which kind of disease was neglected untill it boomranged and then given the same name. Little did I know that they are re-occurring diseases found to majorly break-out in deprived rural poor areas. "Ohhh, they are majorly found and seems restricted to far remote rural areas... "this gave me a little relieve. But still, I kept asking myself why those infected were neglected and why their health seems not to bother us; are they not humans like us?... many of such questions kept striking my mind. My inquisitiveness led me to do a little findings on the subject matter in which I am sharing today. I got to know that the explanation for this generic name was not because it was neglected or taken lightly by Governments or Health Organisations but because the areas or people affected by the diseases did nothing whenever the outbreak was noticed. These set of people were reported to be the poorest populations found in remote, rural areas, urban slums, natural disaster prone or conflict regions. It is however dissapointing to now hear about several outbreaks in developing and developed nations and money budgeted to curtail its spread. Neglected Tropical Diseases (NTDs) are unique set of communicable diseases found to mostly occur in tropical or subtropical regions. 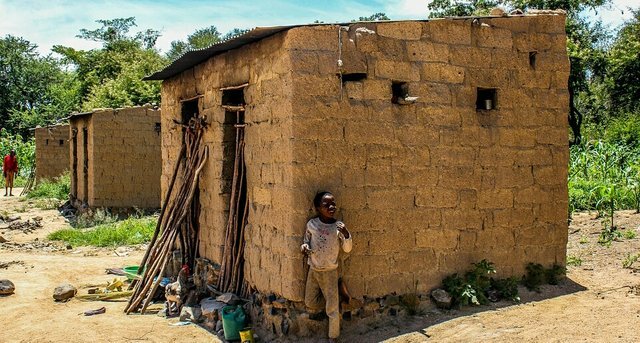 The climatic conditions of these regions characterized by hot and humid weather is one of the many reasons why they were generally referred to as ‘Neglected Tropical Diseases’. However, allow me to discuss three of the cases that is most prominent in my region one after the other under the headings; case definition, life cycle and diagnosis. Onchocerciasis is a scientific term used to describe cases where a person has a painless nodules or swellings under the skin or a condition called leopard skin. 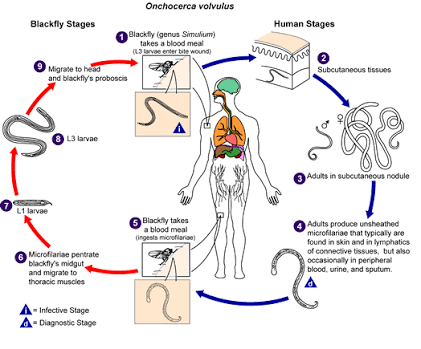 The lifecycle begins when a female blackfly injects blood from an infected person into another susceptible person, baby worms from the blackfly are transferred into another person’s skin when the blackfly bites them. However, we need to understand that both the male and female adult worms in the infected person skin can live up to 15 years producing several baby worms. In this process, the baby worms migrate round the skin throughout the body causing skin rashes, intense itching and leopard skin. When the baby worms enter the eye, the resulting condition is referred to as River Blindness. The Diagnosis is done by taking a small pinch from the waist and examined for baby worms under a light microscope. An alternative diagnosis is to palpate the skin for nodules. 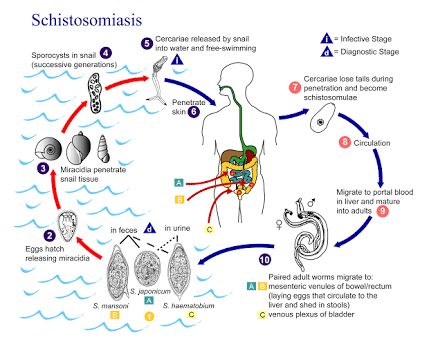 Schistosomiasis is a term used to describe a condition where any person, particular a person below 15 years old has blood in his or her urine. The onset of the life cycle is revealed when an infected person urinates blood that has bilharzia eggs in an open river where people drink or bath inside. Then the eggs hatch and grow to become sharp and slender to become bilharzia baby worms. However, transmission progresses when another person swims or enters the same river which makes the worm to penetrate the skin and travel through the body to the bladder, then to the intestine and then to the liver where they develop fully to become adults and begins the production of eggs in millions. The major reason why there is blood in the urine is because the bilharzia eggs destroy the bladder wall as they made the effort to exit from the bladder of an infected person wall leading to bleeding. However, diagnosis is done on the infected person’s urine for eggs of bilharzia worms when examined under a microscope. 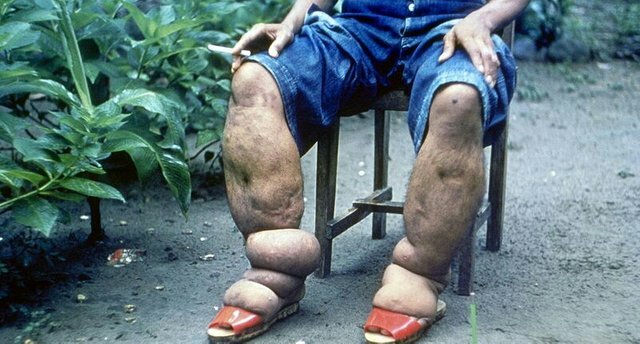 Elephantiasis is a term used to describe a condition where a person has swellings on the limb or scrotum. The life cycle begins when a female mosquito bites and transfer blood into an infected person leading to an appearance of baby worms under the infected person’s skin to the mosquito. So, when the baby worms are injected into the skin of a susceptible person, the baby worms are transferred into the skin. The life cycle process continues when the baby worms migrate to the blood stream and mature into adults within 6 months leading to the production of millions of baby worms. However, the adult female worms can live up to seven years producing millions of baby worms. The baby worms eventually block the streams leading to swelling in the legs and scrotum. Diagnosis is done by taking a small amount of blood and examined under a microscope. ● These diseases results in inability to work and carry out normal day to day activities, thereby leading to poverty. ●Those with skin diseases and scrotal sac swelling in the case of elephantiasis may find it difficult to marry or maintain their marriages. For Onchocerciasis, Mectizan tablets are given once every year to every person in endemic community. The number of persons to take the drugs will be determined by his/her height and age. However, persons such as pregnant women, breastfeeding mothers, children less than 5 years and very sick persons are not eligible to take the drugs. For Schistosomiasis, Praziquantel tablets are given once every year to every school –age child (5-14 years old) in the community except pregnant women, children less than 5 years, very sick persons, sickle cell anemia patients, persons with history of epilepsy and or other signs of potential central nervous system. 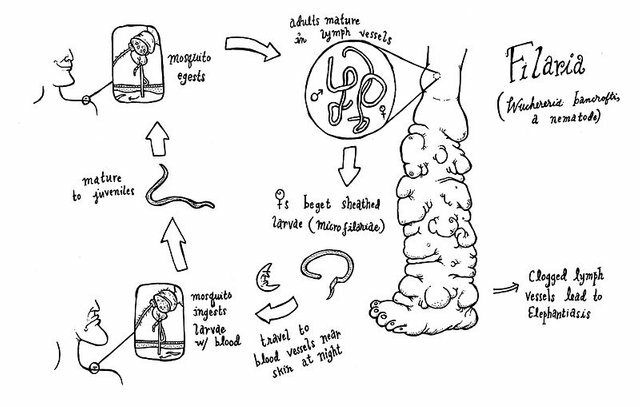 For Elephantiasis, Mectizan tablets are taken with Albendazole tablets once every year to every person in the community. 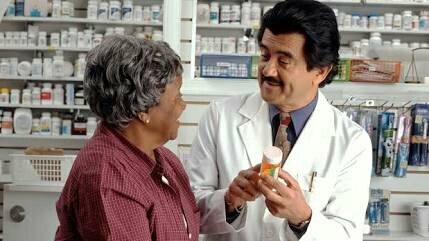 Also, the number of tablets an individual will take depends on his/her height and age. However, pregnant women, breastfeeding mothers of less than 7 days after delivery, children less than 5 years and very sick individuals should not take the medicines. It is necessary to wash and raise the affected part of the body with clean water and soap at least twice a day. This will minimize infection, increase lymph flow, reduce frequent attack of filarial fever and reduce the size of the elephantiasis. Those with swollen scrotum should be referred to the hospital for corrective sugery. @Teemike, thank you for using the naijapidgin tag. Excellent, always nice to see someone talking about neglected tropical diseases on this platform. The more we talk about them the less neglected they will be (hopefully)! 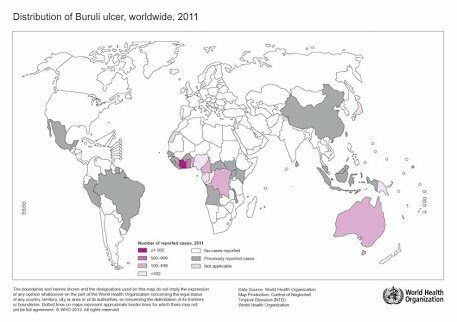 To phrase NTDs another way, they are the low hanging fruit when it comes to global health. Due to the treatments often being spectacularly cheap and easy to administer if anyone wants to do good in this world donating to a charity like Schistosomiasis Control Initiative can be a spectacularly effective use of charitable donations. Followed and resteemed for visibility. 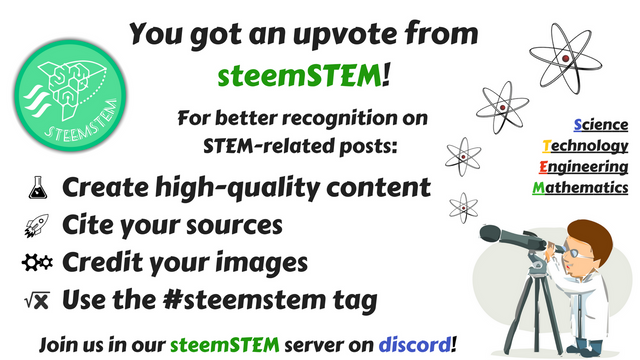 Keep up the good work @teemike!